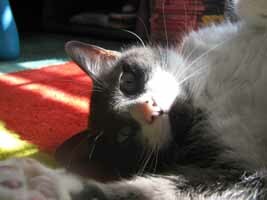 I cannot believe it has been almost seven years since we adopted Bernadette (Nov 2004). She continues to be a wonderful companion to all of us, including our younger son Jesse, who is five and has never known a house without Bernadette. Jay and Jesse love Bernadette (Jay even has a stuffed kitten with markings like hers, that he has named "Little Bernadette"). The boys' like to pretend that Bernadette is the mother of all their toy kittens. She has been a wonderful cat - endlessly curious about the world outside (oh how she wishes she could go out on her own!) and a gentle companion to everyone. Bernadette passed away earlier today. We figure she was about 14 years old. She had a wonderful life and was loved very much and brought us much love in return. I can't thank you all enough for bringing her to us.